We’ve had a bit of a clear out here at GCHQ. We’re real gear hoarders so sometimes we have to be firm with ourselves and let some stuff go we don’t really use or want any more. 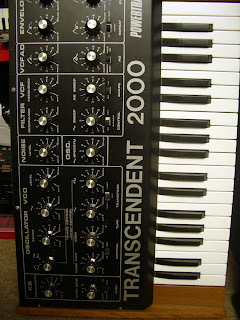 As well as a stack of guitar pedals (we just luv ‘em) we also said goodbye to our Powertrain T2000 analogue mono synth. Originally supplied in kit form this synth was a bit of an impulse buy and never really worked (found out since 2 of the chips had gone) – we used it as a synth FX generator for a while but never really got much use out of it. Anyway it’s gone to a good home and is well on the way to being restored back into full working order. 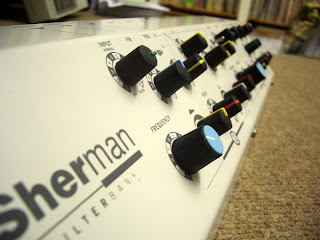 Of course us being us, when something goes another bit of gear is sure to replace it ……so hello our V1 Sherman Filterbank! Haven’t had time to get into it yet as we’ve been pretty busy poppin’ and lockin’ (see last post), but we’ll post a report when we give it a good run out. Apparently it’s a bit of a beast – sounds good to us!